Continuous sea-level rise and massive erosion, both manifestations of global climate change, are shrinking the size of Sandwip upazila and this is on the verge of disappearance. Climate displaced people are common phenomenon in this upazila and the number of suffered peoples are countless. Speakers are very much worried in the stakeholder consultation meeting on climate displacement which was organized by YPSA on 25th November’13 with the participation of GOs, NGOs, journalists and civil society groups working for Climate Displaced People under YPSA’s Housing Land and Property Rights Initiative project at Upazilla conference room of Sandwip Upazila Parishad supported by Displacement Solutions. 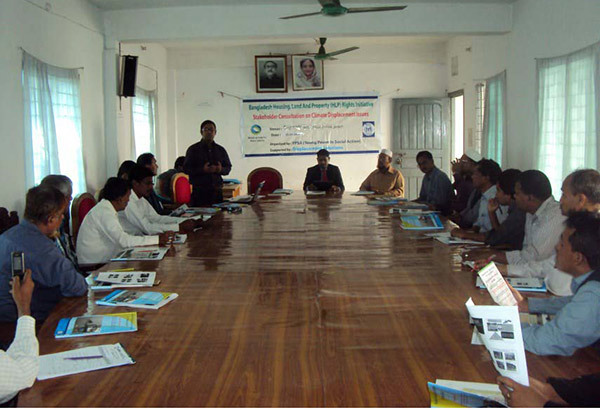 In the stakeholder consultation meeting, Upazila Nirbahi Officer of Sandwip Mr. Noor-E-Khaja Alamin was present as chief guest. Mr. Firoz Ahmed ( Upazila Education Officer, Sandwip), Abul Khair Nadim (Chairman of Musapur Union Parishad), Md. Javedul Islam (Chairman of Amanullah Union Parishad), Md. Samsuddin (Chairman of Gasua Union Parishad), Md. Mizanur Rahman (Chairman of Maitbhanga Union Parishad), Md. Saiful Karim (Acting Chairman of Sontushpur Union Parishad), Kazi Arif (Chairman of Horispur Union Parishad), Farzana Khanum (Acting Chairman of Mogdhora Union Parishad),Md. Delowar Hossain (Chairman of Dirghapar Union Parishad), Mohammed Ali Khasru (Chairman of Haramia Union Parishad), Abdul Malek (Chairman of Sarikait Union Parishad), Md. Anowar Hossain (Chairman of Azimpur Union Parishad), Md. Hasanuzzaman Mamun (Chairman of Rahmatpur Union Parishad),A.B.M Siddiqur Rahman (Commander of Bangladesh Moktijoddah Songshod, Sandwip), Md. Didarul Alam (Upazila LGED Engineer), Mr. Rahim Hossain (Secretary of Sandwip Press Club), Md. Ashraf Hossain (Senior Project Coordination of Social Development Initiative), Ahidur Rahman (Officers of AC Land, Sandwip) also participated. During the open discussion project coordination of Society for Development Initiative (SDI) mentioned that Climate change has effected intrusion of saline water into the soil of these islands. This has caused an alarming decline in the production of different species of paddy, jute, betel leaf, coconuts, date and wheat. He said, 600 square miles of the Sandwip Island has already gone under the sea, with its area shrunken to mere 70 square miles. In 1987, the area of the island had shrunken to 258 square miles in 1920, 137.16 square miles in 1981, and 100 square miles in 1987. Many of the local representatives mentioned that during the last 25 years, a large chunk of the island has gone under the Bay of Bengal, as well as the Meghna estuary. Even a few decades back, there were Katgor, Ijjotpur, Hudrakhali, Nayamosti and Batajora union parisads at the island. Since then, all those localities have disappeared under water. Every year, thousands of people become “climate displaced people” at the island, especially during the rainy season. UNO mentioned in his speech that, YPSA is performing greatly in this area for the betterment of community people. These are a kind of initiatives which focuses on the rights of climate induced displaced families, Bangladesh ratifies the UN charter and we are responsible to ensure the rights of the displaced people. From local administration we are promising our full support in such initiatives from YPSA. Program officer Mr. Syed Assraf Ullah HLP program introduce short profile of YPSA to the audience and Mr. Prabal Barua presented the keynote on HLP rights in the meeting.